In order to understand what Raydiant Lightware is and how it works, you have to think of yourself in a new way.1 You have to conceive that, despite your body's apparent physicality, it is made up of interrelated, nested morphic ("form") fields. Everything, including us, is at one level made up of interacting, nested fields of light-energy. These fields are us and they are made "real" in and through our consciousness, and through our different projects in life as we interact with all that we encounter. 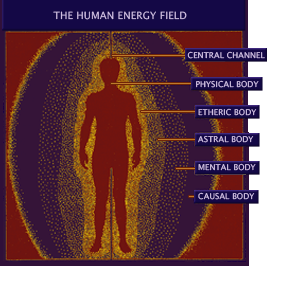 Dr. William Tiller, professor at Stanford University and former chairman of the Department of Materials Science, offers a model that examines the nature of the different energy fields or "bodies" that make up the human energy field. His model is founded on the fact that many energy fields of different frequency can co-exist in the same space at the same time.4 He identifies four primary subtle energy bodies that interface with the physical body, each with a different theme of function and placement in the hierarchy of information flow. Within space-time reality Tiller identifies two different but deeply intertwined and interdependent vibrational bodies, the physical and the etheric. The physical form cannot survive without the energizing nourishment and organizational guidance given by the etheric body. However, it's also true that when the physical body dies, the etheric body dissipates into the universe. The next set of subtle bodies exist beyond the etheric body. These bodies are more difficult to perceive and understand as they exist in a non-physical or non-space, non-time realm. Together they function as multiple vehicles of containment for consciousness. As each of the subtle bodies interpenetrates the physical body, there is an energetic interplay between them. The interplay follows a stepping or "ratcheting" down from the higher vibrational bodies to the lower. An energetic occurrence happening in the mental body is transmitted first to the astral body, then to the etheric, then on to the physical. Likewise energy inputs from the causal level cascade down through the three mental bodies before passing through to the astral level. 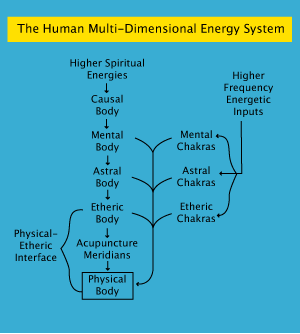 The meridian system is an energy system within the physical-etheric interface, providing vital energy and information to the electromagnetic terrain of cells, tissues, and organs.7 Your chakras, on the other hand, operate at three subtle body levels, interfacing with information and energy at the mental, astral, and etheric levels, as well as providing nourishment to the physical body. The second law of thermodynamics states that energy moves from higher to lower temperatures, and that this process reduces the state of order in the initial system, thus we find a movement toward disorder in the universe (this is true, in particular, in the universe of my garage). However, living systems are a notable exception to this rule. Biological systems take in raw material, break it down into elements, and then build complex macro-molecular structures (from protein and DNA, to tissues and organs). Life-force then seems to be associated with negative entropy. The four subtle body fields (the etheric, astral, mental, and causal) can be understood as making up this "life-force", providing you with negatively entropic energy and self-organizing information.8 (Notice that once you die, your physical body quickly succumbs to positive entropic forces). And so, while a materialistic view wants to think of these subtle bodies as if they sprung from the physical body field, it is the higher fields which coalesce physical "matter," and not the other way around. 1The treatment of this topic and others dealing with how Raydiant Lightware works is vastly simplified, and as such, subject to all the problems and inaccuracies of any over-simplification. My purpose here is to provide a basic framework for understanding the technology and processes offered through Raydiant Day. There is a great deal more to be said and sorted out. See the bibliography for interesting jumping off places. 2Robert Lawlor, "Pythagorean Number as Form, Color, and Light," Homage to Pythagoras, ed. by Christopher Bamford, pg. 190. 3Newtonian physics, or classical mechanics, still accurately describes macro level physical laws, where "things" like apples still fall from "things" like trees. 4For example, radio and TV broadcasts travel non-destructively through the same space because they occupy different frequencies. This allows for the interpenetration of countless fields as well as communication or transduction between fields. This transduction, combined with morphic resonance, is the mechanism for the transfer of information through your multi-dimensional self. 5Vibrational Medicine, by Richard Gerber, p.157. 6Vibrational Medicine, by Richard Gerber, p.166-7. 7Kim Bong Han's studies of meridian systems found that the development of the meridian tubule system preceded the organization of the physical organs, suggesting that energetic input from this etheric level provided the spatial guidance necessary for the structural organization of the physical body. Vibrational Medicine, by Richard Gerber, p.163. 8While positive space/time matter is associated with the forces of electricity and electromagnetic (EM) radiation, negative space/time matter (supra-luminal particles, or particles travelling at velocities faster-than-light) is associated primarily with magnetism and a force Dr.Tiller describes as "magneto-electric radiation." Vibrational Medicine, by Richard Gerber, p.147.